I’m not sure how many rules I broke with that title, but I’m also not sure that it even matters. So that’s what I did with this dish: make it the best possible version of itself – even if it takes a bit more effort and time. While a scampi sauce is intentionally basic, I came up with one solid idea that really ties the whole dish together (and gets of rid of leftover waste while we’re at it). After peeling and deveining my raw shrimp, I utilized all of the leftover shrimp shells by creating a simple stock. One scant cup of this intense shrimp stock adds some necessary depth to the traditionally lemon, butter, and wine flavored scampi sauce. But what about the shrimp themselves? Breaded and fried, obviously. Anyone who’s familiar with the Milanese method of preparing chicken or eggplant will feel right at home here. With a dash of lemon zest and cayenne pepper mixed in with the panko breading and a quick shallow fry in olive oil, the shrimp become downright addictive – the perfect topping for pasta with scampi sauce. And the best part is that the shrimp can be breaded and stored in the refrigerator ahead of time, ready to be fried as the pasta approaches al dente. 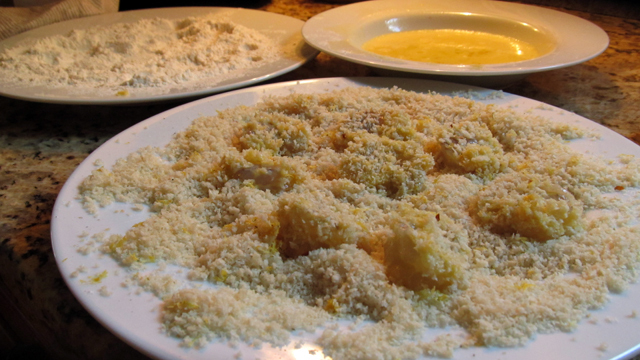 Prepare the breading: fill three plates with flour, beaten egg, and panko. Lightly salt and (black) pepper each. Zest one lemon onto the plate of panko and add a pinch of cayenne pepper; mix. Prepare the shrimp: de-shell and de-vein, saving the shells in a bowl; then bread the cleaned shrimp in flour, then egg, and then panko. Store on a sheet pan fitted with a rack and keep refrigerated until ready to fry. Make the shrimp stock: place all of the leftover shrimp shells in the small saucepan and then cover with water (a little over a cup). Bring to a boil and then simmer for 5 minutes; then strain liquid and discard shells. Begin the scampi sauce: melt 2 tbsp of butter in a medium saucepan with the sliced shallot and a pinch of salt. Lightly sweat until the shallot is fragrant and translucent. (Optional: add a few dried herbs like chili flakes or oregano.) Add the white wine and let reduce at a simmer for 5 minutes. Add the shrimp stock, remaining zest of one lemon, and all lemon juice and keep at a simmer. Taste for seasoning. Cook the pasta: Place pasta in a giant pot of boiling, salted water and cook until al dente. Before straining, save a cup of the salty, starchy cooking water incase the finished dish needs more liquid (a coffee cup works great for this). Fry the shrimp: Heat a large sauté pan over medium-high heat. When hot, add enough oil to cover the bottom of the pan. Add the shrimp in a single layer and cook for under 2 minutes on each side. When done, keep on a sheet tray with rack in a warm (170 F) oven. Finish the pasta: Return the pasta to its pot over very low heat and pour the scampi sauce over; stir. Add in the parsley, and then stir in the remaining 2 tbsp of butter. Check once again for seasoning. Plate: Spoon some pasta into a bowl, top with the fried shrimp, and garnish with parsley. Enjoy with a glass of chilled white wine.